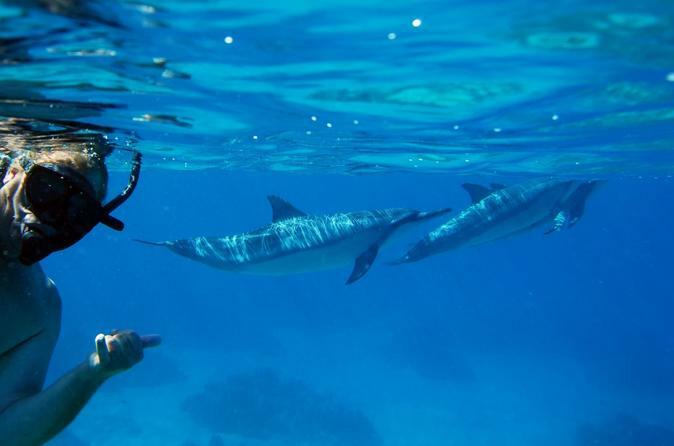 Snorkel with live dolphins during this 3-hour adventure along Oahu's hidden coastline. Powerboat out to pods of spinner dolphins for a passive swim followed by additional snorkeling at Oahu's second largest reef or visit turtle town to catch a glimpse of Honus or turtles. Finish with a delicious Hawaiian style lunch of Teriyaki chicken or pulled pork sandwiches with pasta and fresh fruit . Shuttle service from Waikiki included. Your exclusive wild dolphin snorkeling session starts with a morning pick-up from select Waikiki hotels for a quick ride to the marina. Early morning pick-ups typically occur between 5:00 and 5:40 am, mid-morning pick-ups start at 8:45 and conclude 9:40 am. After arriving at the operator check-in, feel free to enjoy a hot cocoa or tea - both morning beverages and lunch are included on the tour. After meeting your captain and the rest your group of no more than 30 people, you will ride out on a powerboat to snorkel your first site to get acquainted with your gear and the local fish. From the boat, you are free to enter the water and explore your surroundings at your first snorkel site. Next, we are off to see if spinner dolphins are in the area, and viewing is possible. About 90% of the time, pods of 20, 30, and even 100 dolphins have been regularly sighted playing and feeding in the water. After enjoying the dolphins, you will head to another location for a special reef swim and snorkel on Oahu's second biggest reef. You will quickly find yourself surrounded by thousands of brightly colored fish as gently swim through warm, temperate water in a tropical paradise. From the reef, it's off to lunch for your choice of traditional, mouthwatering Hawaiian pork, sweetly glazed chicken teriyaki, or a vegetarian option. The day concludes with a complimentary drop off back at your Waikiki hotel at the parking lot back at the facility.